Don't let a friend drag you off your budgetary discipline right now. You could be all too tempted to break out the credit cards for something like a trip to the big game or amusement park, and that could be something you'll enjoy now, but regret later. The faxes are buzzing. The phones are ringing off the hook. The email is rolling in. You may have a hard time keeping up with all the mental chatter you are exposed to now. You have a major case of "information overload". Go with the flow - don't try to fight things. 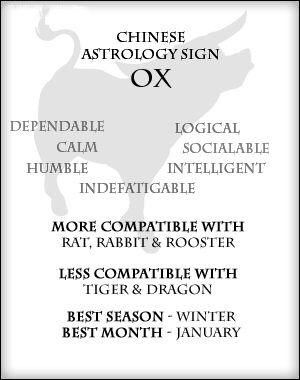 Ox is the second in the 12-year cycle of Chinese zodiac sign. Years of the Ox include 1913, 1925, 1937, 1949, 1961, 1973, 1985, 1997, 2009, 2021, 2033…Oxen used to be capable farming tools in agricultural society, which attach to the symbol of diligence, persistence and honesty. People born in the Year of Ox are probably tardy in action, but industrious and cautious. Most of them are conservative and hold their faith firmly. Ranking second in Chinese zodiacal signs, the Ox is huge. People often use it to indicate something big in size or number. People born in the Year of Ox bear persistent, simple, honest, and straightforward characteristics. They are talent leaders with strong faith, and strong devotion to work. They are contemplative before taking actions, not easily affected by the surroundings but just follow their concept and ability. Being conservative with a lack of wit in speaking, they usually look silent and sometimes stubborn in their old ways. They are quite compatible, deeply attracted by each other. They are both responsible, willing to share the family duty. Besides, loyalty and faith are the key factors to their happy marriage. They will stick on their own opinions and ideas, and they both can hardly give in. They don’t get used to forgiveness, and squabbles lead to their relationship reaction. Best Jobs: Lawyer, doctor, teacher, technician, politician, office clerk, consultant..
Wood Ox 1925, 1985 Brave, selfless, upright and outspoken. Fire Ox 1937, 1997 Clever but lacking one’s own judgement, short-sighted, narrow-minded. Earth Ox 1949, 2009 Smart, confident and resolute; hard to have high opinion of others. Metal Ox 1961, 2021 Busy and active, with good interpersonal relations. Water Ox 1913, 1973 Hardworking and diligent, holding a strong feeling for justice.